Mom, the Intern: Lumps, car crashes, staples and more. Lumps, car crashes, staples and more. So, life lately. What can I say? A lot, actually. Let's go in chronological order. In July, I found a large-ish lump on my rib cage. Lumps are kind of a big deal, so I had an ultrasound. The doctor says it's PROBABLY a lymph node but maybe not, so we're watching it for now and possibly doing a biopsy next month if it doesn't go away. It's still hanging around like it's my sidekick, so that biopsy is looking more definite with each passing day. Maybe I should give the lump a name. Trudy? Morticia? I'm open to suggestions. In August, I accidentally crashed the front of my car into the shelving unit in the garage and it nearly pulled the whole right fender off. I promise, I'm not a total moron. It's REALLY tricky to park our crossover vehicle in a two-car garage with a very short driveway and no room to swing out due to poor planning on the developer of our community -- seriously, who puts grass and trees RIGHT behind someone's house when their garage is in the back? 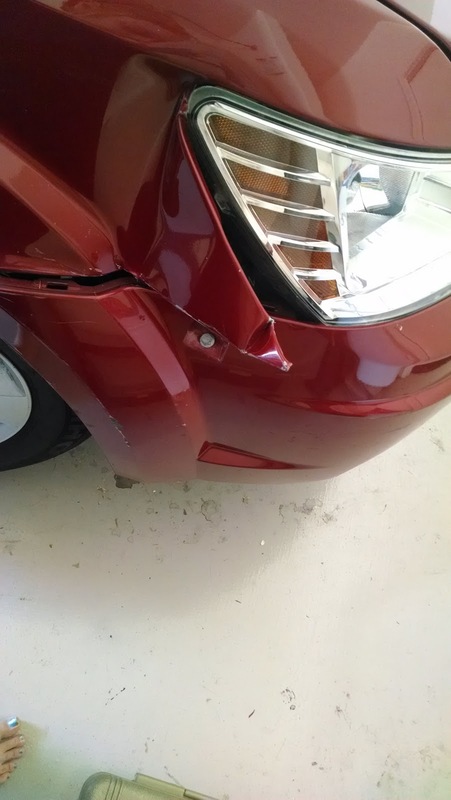 Three body shop quotes later, the whole ordeal is going to cost $700. I definitely cried over that one. Then, last Thursday, I was rocking out choral-style with MCO when all the sudden, I got a text from Dill. Dill, the man who never texts me, ever. It said, "Call me now!" So I did. And it turned out Carson had hit his head on something while rough-housing and "probably needed stitches," which turned into definitely needing staples. Bless Dill's squeamish heart, he took him to the ER that night because babies gotta eat and I have the monopoly on milk-making around these parts. 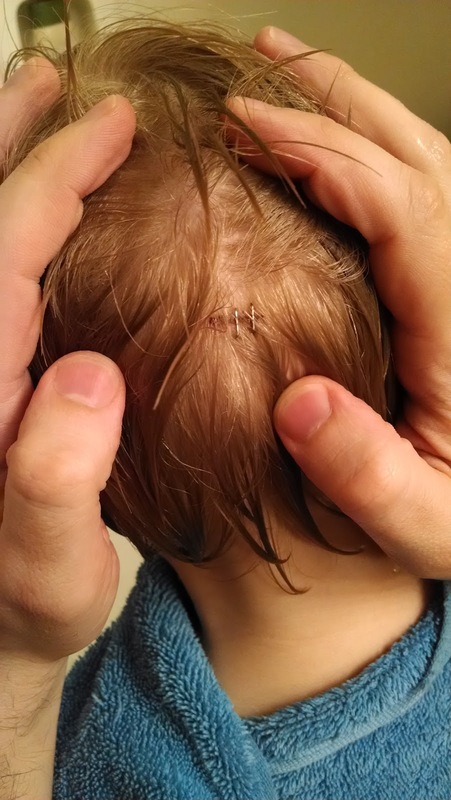 Three hours later, the two returned home, Carson with a fresh set of staples in the back of his head. Surprisingly, I'm actually not too mad about it because I honestly thought it would've happened sooner. THEN on Sunday, I'm sitting in church when Carson walks up to me with pink eyes and yellow goop in his eyelashes. In other words, CONJUNCTIVITIS!!! Without hesitation, I ordered Dill to take him to the nearest urgent care and get that crap taken care of because pink eye is the worst. Not because it actually hurts or anything, but because putting eye drops in a child's eye is more difficult than tying up a greased hog on a rainy day, and you have to do it not once, not twice, but THREE TIMES DAILY. By the way, Dill didn't believe it was pink eye, but guess what? It was totally pink eye and guess what else? Dill had it, too! Oh boy. They probably picked it up from their emergency room visit. So all of us got it except baby Clara (so far). Which is why I'll be sporting glasses for the next week or so. Any-hoo, in all that excitement, I'd nearly forgotten I was guest-posting on my friend Jen's blog, "Nothing Can Come of Nothing" for her Marriage Month series! I'm glad I remembered today. You should go check it out. I talk all mushy about how Dill and I met, discuss some less-than-fun aspects of marriage and also give a little marital advice. And Jen's blog is great, anyway. I really like her. You will, too. Reminiscing on our cute little courtship helped me momentarily forget about all this junk I'm dealing with. So thank you, Jen, for the opportunity to remember the important things in life. I may have a lump on my ribs, a wonky right fender, a kid who looks like Frankenstein's monster and a family ridden with pink eye, but I also have the best husband and kids a gal could ask for. In the meantime, if you have any tricks to getting a 4-year-old to cooperate for antibiotic eye drops, let me have 'em. Because really, it's getting ridiculous. Oh my goodness. I am SO SORRY. Broken cars and pink eye and questionable lumps??? Ugh! Although I am a fan of Trudy, if you decide to name it. Good luck, dear. Hugs and prayers. My lump in my cheek is named "Howey". It's been there for as long as I can remember.